Otto Hillig arrived in the United States as a teenager in 1892. He worked over the years as a street car conductor, a bartender, and a brewery worker, but he spent most of his life as a photographer. He started in the world of photography about 1897 and photographed just about everything he could, making tens of thousands of pictures over the years. In 1934, he began building his castle, which is built entirely of river stone. Otto Hillig died on Sept 12, 1954, and the castle was left to the Grand Lodge of the Masons of the state of New York. The building sat vacant for years while vandals stripped it of anything worthwhile, and destroyed what was left. Soon, the castle was not much more than an empty shell. In December 1973, Janis Blair came to it's rescue and purchased it from the Masons. 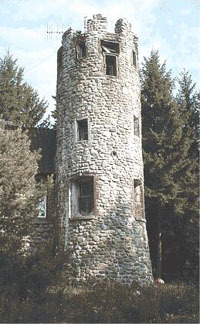 Blair was also the owner of Gelston Castle located near Jordonville, New York. She had Hillig Castle restored to a livable condition and added an extension that covered the verandah. She used the castle as a residence and as a home for handicapped adults. In 1978, she sold the castle to a family from New York city. Since then, the castle has been used as a weekend and summer getaway. From what I can tell, the castle is not visible from the surrounding area because it is surrounded by tall trees. I do not believe they give tours. Much of the information on this page came from "The Towne Crier" of Sullivan County.